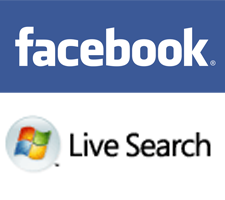 Microsoft SVP Satya Nadella has announced that the company has expanded its deal with Facebook to integrate Microsoft’s Live Search into the social network. There are few details at this point, but Microsoft will be serving up advertising (both traditional and sponsored search results) through Facebook by the end of the year. Microsoft previously bought a $240 million stake in Facebook at a massive $15 billion valuation, in exchange for global advertising rights. The news parallels the search deal that Google signed with MySpace in 2006, when it won the rights to provide search and advertising to the News Corp-owned social network, with a minimum rev share agreement of $900 million. Microsoft was also clamoring for search rights on MySpace at the time, but Google managed to beat it out by forging a hasty deal. Google has had a hard time monetizing the search deal with MySpace, but it blames the under performance on the difficulty with monetizing social networks in general. It’s probable that Microsoft will run into similar issues on Facebook, but it may be just as concerned with exposing users to Live search as it is with generating revenue, at least in the short term. Back in 2006 Michael speculated that Microsoft may have been taking a loss on its initial advertising deal with Facebook, simply to beat out Google and get some traction in the advertising space. It may be taking a similar approach here. Microsoft is eager to expand its Live search, which has languished far behind Google and Yahoo for years. In May the company launched an apparently desperate move to actually pay users for using the site through its Live Search Cashback program. That initiative has proven to be a success, increasing search usage by 15%. But Live search still trails Google and Yahoo by huge margins, accounting for only 9% of all search queries (Yahoo and Google account for 21% and 62% respectively).